A “Train the Trainer” seminar took place February 23-25, at the Lotus Training Center in Den Bosch, Holland, followed a week later, by the trainees giving a seminar to a group of 40 teachers. The following two articles, philosophy Masterclass in Neohumanist Philosophy for Education, and Philosophy in Action, document these two successive events. 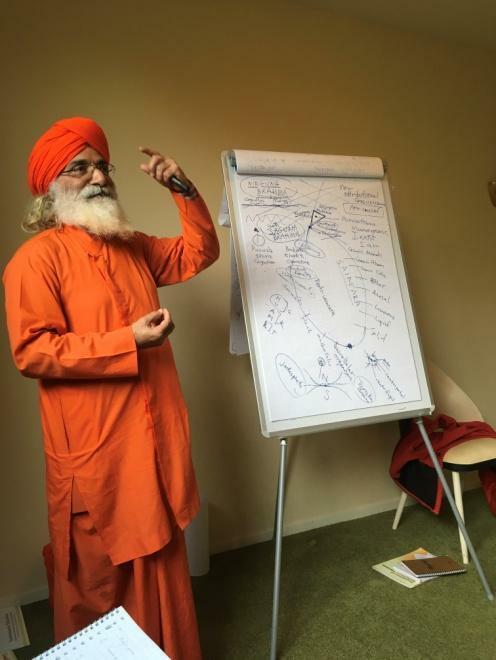 How does one get a deeper understanding of some of the key concepts in the teachings of Shrii P. R. Sarkar for inspiring Neohumanist Education & educators in Europe? In Den Bosch, Netherlands, as an effluence of the wish to get more clarity and experience on this topic, a three-day philosophy masterclass was conducted for Neohumanist educators by Dada Shambhushivananda at the Lotus Training Centre. This article is written to give an idea about what was discussed and the approach that we took. But it also covers some of the educational insights that resulted from this approach. Society is changing faster than ever and education is changing with it at an evenly rapid pace. A day in our normal life is no longer comparable to a day in the time that Patañjali wrote down his 8 limbs of Yoga. Even after Shrii P. R. Sarkar last expressed his understanding of the mind much has changed in daily life under the influence of technology and developing futures. And even much more change is natural and necessary to cope with our future society’s needs. How can we find new ways today to relate to these philosophies that have their roots in old scriptures? Ofcourse these concepts still have great significance in modern-day life in Western Europe, but how can we relate to them in modern society? How can they help us now? And what bridges do we need to overcome, in a European context, where everything needs to be proven and understood before it can be experienced or accepted? Eg. In a very secular context, almost everything that is said about spirituality is considered dogmatic and basically not to be trusted. That is quite a challenging context for these philosophies. To increase our trainees’ rooting in this philosophy and to grow their understanding, we focussed on approaching three big concepts of Neohumanist philosophy; Brahma Cakra, the Yamas and Niyamas, and the Kosas, or Layers of the Mind. We did this with a practical take on Neohumanist philosophy. The angle taken was not so much an academic analysis of what was written and said, but it was more about how to implement the core concepts of Neohumanist philosophy in a training or a lesson or a spoken expression. The topics/concepts were approached from an educational perspective by a group of teachers that were willing to express this philosophy to other professionals in training and education. The sessions were mainly conducted by Dada Shambhushivananda and soon became enriched and fuelled by the input and experience of teachers and trainers with combined decades of experience in education. On the first day of the training we shared our personal situations as teachers and trainers. Where do you work, and what is the relevance of this philosophy for your work in education? Why are you attending this training, and what are you hoping to gain from this? After this we dove into the topic of mind. Dada started by refreshing the concepts and philosophy of the realms of the mind. The Kośas were one by one unraveled, and connected to more familiar topics and concepts. Also the connection between the witness mind (Mahat) and the layers was clarified. 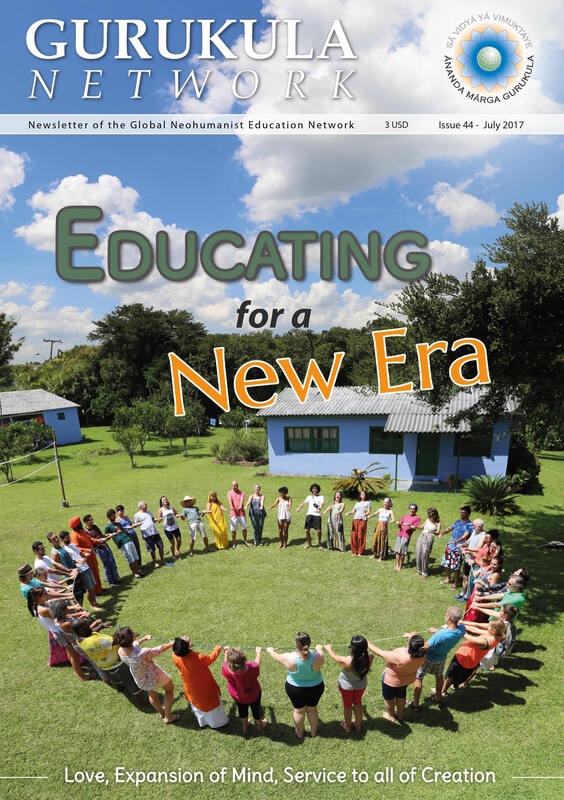 Because all trainees already were involved in Neohumanist Education for some time, they already knew quite a bit about the topic. But it was, in substance and in depth, a useful refresher of known concepts—at first. And by asking questions, there were also many new discoveries and neural connections made in this session, judging from regular cries of “Aha” as a sign of increased understanding. What teacher qualities are needed in helping children to grow at the Atimánas Kośa (creative layer of mind)? What are inner and outer expressions of the Manomaya Kośa (intellect) in children at several age groups? “Understanding, exploration of objects and qualities” and “Sorting, combining, and associating”, at a certain age. We related that to necessary teacher qualities for age-related needs of the children to grow (things like discernment of needs, facilitating experiences and encouraging investigation). Getting more understanding by expressing this in front of a group was clearly a valuable exercise. These small stories about Ahimsa/Satya/Tapah… became the subjects of an interactive discussion supplemented by other teachers and trainers. Finally Dada added an extra layer of clarity to the topic by explaining the true intention and refinement from a deeper understanding. What teacher qualities are needed for cultivating Tapah in children? “Willingness to sacrifice” / “Endurance” / “Devotion to duty” / “Putting children first”. And what about qualities needed for Aparigraha? “Sharing and a philanthropic attitude” / “Contentment” / “Inner trust” / “Take only what you need” / “Maximum utilisation”. In about fifty minutes, the Yogic understanding of the creation cycle of the cosmos was explained; From the triangle of static, mutative and sentient forces to the development of the human beings, up until their final realisation. This continued in a fascinating and inspiring talk from Dada about the implications Brahma Cakra has for education, including the social cycle and the future of civilisation. This touched us all and we listened with a great deal of interest. What can your educational organisation do better to develop a sense of purpose in children? If we look at Brahma Cakra and Yama/Niyama, what can we do better at an organisational-level? Of course we ran over time – discussing the entire universe and education in a broad philosophical way. That did matter mainly to the people waiting outdoors for us. We on the other hand were focussed on the fruits and applications of this Philosophy; passing of time seemed relatively unimportant. Looking at the core of Neohumanist Philosophy in depth, the fruits are many and they are ready to be harvested. For instance, by adding an extra layer of perspective and clarity to understanding ourselves and the world we live in better. But the applicational value for education is much wider. From the understanding of the necessity of broadening education and curricula – for inspiring society’s children to learn more – and infuse them with a sense of wonder to get to know the contents and layered structure of their most used tool…the mind. Realising this, you can’t be anything but joyful because of the inherent added value that this philosophy has for the modern secular society and more particularly because of the added value for education. The sources that can be tapped in this philosophy are deep and rich, also for the western European context today; Maybe even more than ever before. Looking specifically at Yama/Niyama in depth one can easily flow into a regained understanding of the valuable and irreplaceable role of a good example in a moral value teacher; A teacher that is unified in expressing and living these values as an example. Looking specifically at the Brama Cakra helps to focus us on the bigger picture. What do you love most in this world – and what is worth fighting for – to you? What do you wish for this world? And after getting a deeper understanding of these philosophies – and yourself; How can you best be of service? These realisations can subsequently be transferred from a deeper understanding to the children that you guide – to awaken a flame in them. A feeling of belonging to a bigger context, a love for the Universe in all its diversity, and a feeling of wanting to contribute your best possible work and self. During this philosophy Masterclass, plans were finalised for follow-up training. This training was given one week later – as a knowledge integration assessment – by the trainees of the Masterclass. The trainees gave this training to a group of 40 teachers. You can read more about this training in the article “Philosophy in action – three day teachers training” in this newsletter.